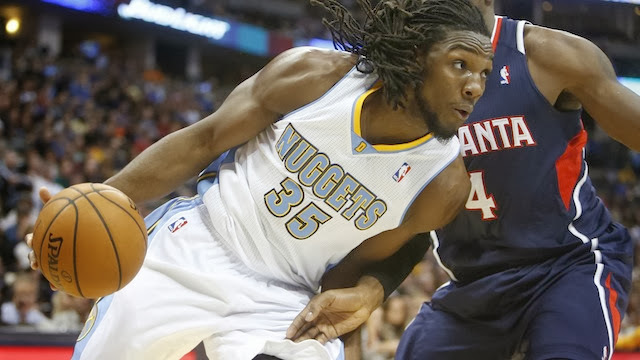 For a few weeks now, the Denver Nuggets have been shopping power forward Kenneth Faried. Faried is a hyper athletic, undersized power forward who specializes in finishing at the rim and rebounding. He's the kind of grind-it-out player that Joe Dumars has made a priority in Detroit, but he doesn't fit the triangle offense that Denver Nuggets head coach Brian Shaw wants to run. Enter Greg Monroe, a proficient post player having a career year despite the Pistons' revamped frontcourt struggling. Though they're rounding into shape from where they started the season, the Pistons' ultra-big frontcourt still boasts a net rating of -3.1 and fails to deliver the rim-protecting defensive-mindedness that was promised when the team was assembled. The Pistons' starting frontcourt current has a 105.1 defensive rating, which is shocking given the their size and individual defensive prowess (Monroe notwithstanding). One reason for the subpar defensive rating may be Mo Cheeks' agenda to jump passing lanes and generate steals, a high-risk/high-reward defensive strategy that doesn't seem suited for a team with such defensive potential, but regardless, this experiment has shown more flaws than solutions. Regardless, there are as many problems as potential solutions right now and when Monroe's contract is up at the end of the year, losing him without getting anything in return would be devastating. My desire to trade Monroe has been a talking point for this blog this season. If the Pistons were able to get a young small forward or draft pick in return for Monroe's soon-to-be max contract, that would be a huge win for a team that both can't afford the likes of Monroe, Smith, Jennings, and Drummond's salaries once Andre needs to re-sign, as well as a team that doesn't work schematically in a league increasingly moving toward outside shooting. Though the trade for Faried wouldn't solve all of the team's schematic problems, using him as a bench forward could give the Pistons significantly more flexibility and depth. Monroe's contract is too large to take on only Faried, so throwing in rarely used Anthony Randolph would balance the deal. In order to make the numbers work, the Pistons would need to send back another player. Tony Mitchell's contract doesn't make any difference in the trade and would entice the Nuggets to part ways with their raw, athletic power forward if they were getting another one in return. There are complications with this trade other than 2014 first round picks being the hottest commodity in the NBA. The Nuggets are currently owed two first round picks in the 2014 draft: their own and the Knicks' unprotected pick. However, the least favorable of those two picks is already due to the Orlando Magic. Trading away the other would remove the Nuggets from the first round entirely, a harrowing prospect in a draft this deep. To sweeten the deal, the Pistons could throw in their second-round pick in addition to Mitchell and Monroe. That may sound unlikely, but if any team were interested in overpaying for a polished post scorer, it would be Brian Shaw's Nuggets. It's not secret that Shaw has been disappointed by his team's post play. For the triangle offense to work at peak efficiency, that post player becomes a necessity. Monroe presents a prime opportunity for Shaw's team: rarely will they find another player as polished in the post with the upside and years left in his career as Monroe. The Nuggets could try to hold out until the season is over and make a run at Monroe as a free agent, but the Pistons hold the edge in that pursuit (he is a restricted free agent) and Dumars has made no indications that he is willing to let Monroe leave. 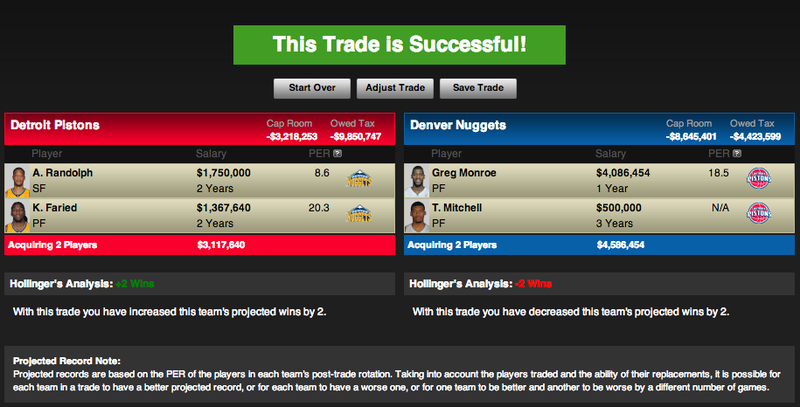 Without Monroe, the Nuggets are left to find a post player in the draft or make a run at someone like Pau Gasol. Faried could easily slide to center alonside Smith in the second unit, creating an undersized, athletic frontcourt or play alongside Drummond with the second unit and wreak havoc on the offensive glass. Most importantly for the Pistons, however, would be the acquisition of a (likely) lottery pick in 2014. Even late in the lottery, players like Kentucky's James Young or Florida's yet-to-play Chris Walker should be available, filling the sorely lacking small forward position. The likelihood of this trade (or any variation of it) going through approaches zero. Dumars doesn't seem interested in trading anyone from the current roster and the Nuggets won't want to remove themselves entirely from the first round. But Brian Shaw needs Monroe and the Pistons need to find a long-term answer for their small forward and future assets issues.